Westport, CT - Tony Award-winning Broadway and television star Sutton Foster headlined Westport Country Playhouse’s 2018 Gala on Saturday evening, September 8, performing Broadway standards and contemporary tunes with a trio of musicians. 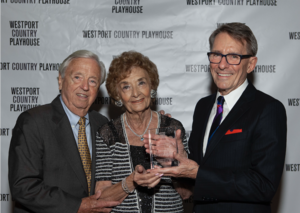 Eunice and David Bigelow, co-chairmen of the family-run Bigelow Tea Company, headquartered in Fairfield, CT, were honored with the Playhouse’s 2018 Leadership Award for their vision and philanthropy. The Gala’s theme, “Andalusian Nights,” tied in with the Playhouse’s autumn production of “Man of La Mancha,” bringing the ambiance of Spain to the evening. The 2018 Gala Committee co-chairs were Athena T. Adamson and Teresa Nardozzi. Committee members included Karen Parrella, auction chair; Barbara K. Streicker, board chair; Mary Ellen Marpe, development chair; Paige Couture, after-party chair; Ania Czekaj-Farber, catering chair; Linda Heinzelman, décor chair; Dana Rutson Robinson, publicity chair; Nancy Tillson, associate auction chair; Molly Alger, Kate Bahnemann, Deb Harper Bono, Jessica Caldwell, Mary Dobson, Dennis Dobson, Katia Friend, Patricia Goodrich, Darlene Krenz, Elanit Linder, Judy M. Phares, Maggie Lehnerd-Reilly, Robin Sauerteig, Tricia Schwartz, Helene Jacob-Skolik, Cheryl Simcox, Maria Mendoza-Smith, Hermon Telyan, Marietta Battaglia White, and Donovan Wildgoose. The Honorary Gala Committee included Maureen Anderman, Frank Converse, Mia Dillon, Keir Dullea, Jill Eikenberry, Daniel Gerroll, Joanna Gleason, Jonathan Groff, James Earl Jones, Patricia Kalember, Anne Keefe, James Naughton, Kelli O’Hara, Christopher and Elaine Plummer, Chris Sarandon, and Michael Tucker. Westport Country Playhouse is a nonprofit 501(c)(3) corporation and contributions are tax-deductible, less the value of goods and services received, as provided by law. Gala proceeds will benefit the non-profit, professional producing theater, now in its 88th season - its work on stage, with schools, and throughout the community.